I am told that both the Greyhound and the Saluki played significant parts in my heritage, and I am valued for my talents as a hunter of small game, such as rabbits and birds. However, my ability to use sight, scent and sound set me apart from other hounds who use only one or other of the senses. I can be shorthaired or wirehaired on the outside, but it�s what is inside that really counts. I am an intelligent, affectionate and loyal hunting companion as well as a dependable and unique family pet. My energy level is high, so I�ll need lots of exercise. When fully grown, I am between 23 and 29 inches tall (58.4 to 73.7 centimeters) and I weigh between 42 and 75 pounds (18.9 to 33.8 kilograms). We have no Ibizan Hound Breeders listed at this time. 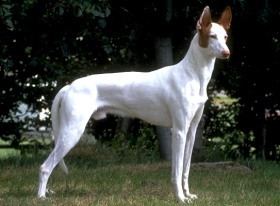 Click here to place your Ibizan Hound Ad!